KAMPALA, Sep 23 2014 (IPS) - Over the years, Cassius Ntege, a fisherman from Kasenyi landing site on the Ugandan side of Lake Victoria, has observed the waters of the lake receding. And as one of the many who depend on the lake for their livelihoods, he has had to endure the disastrous consequences of the depleting lake. Ntege told IPS that he first started going to the lake as teenager to fetch water for domestic use, then as a fisherman, and now as vice chairperson of the beach management unit — a body set up by the government to curb illegal fishing and stop depletion of fish stocks from the lake. But the declining water levels of Lake Victoria have become his daily concern. Expected changes of plus or minus 10 percent from present annual rainfall totals may seem minimal, but it’s the shift in water patterns that are of concern. 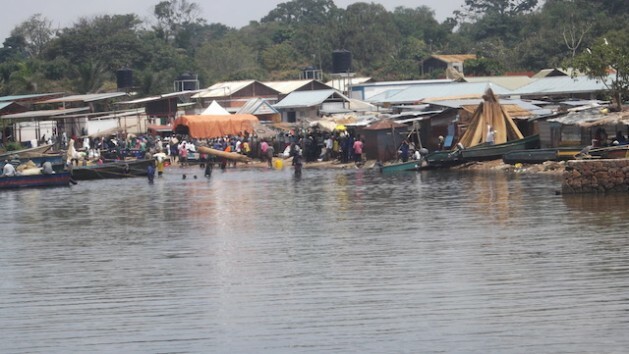 “Look, where that wooden kiosk is placed was previously centre of the lake and now traders have put shops and food kiosks there,” said Ntege as he pointed to the wooden and metallic structures placed about 50 metres into where the lake waters used to be. There are many traders operating businesses at Kasenyi landing site, which lies about 30 km from the country’s capital, Kampala. And for them, a drop in water levels means additional land to set up shop. Ntege, like many fishermen here, believes the decline in Lake Victoria’s water levels is because of the effect of wind blowing across the waters from the land — a phenomenon known locally as “Muguundu”. But climate experts state in the Intergovernmental Panel on Climate Change (IPCC) Fifth Assessment Report that a rise in global temperature is what is affecting rainfall patterns over Lake Victoria — and the worst is yet to come. The report states that increased warming in the western Indian Ocean and precipitation over the ocean system will bring about climate extremes in East Africa and increase precipitation during the short rainy season. Professor Hannes Rautenbach from the University of Pretoria, and one of the authors of the report, told IPS that temperatures are projected to rise by +2°C in the next 50 years, and by +2.5°C in about 80 years. This, he said, would alter rainfall patterns over Africa’s biggest fresh water lake that is shared by the East African countries of Uganda, Kenya, Tanzania. Changes in sea surface temperatures in distant tropical oceans will strongly influence annual rainfall amounts and timing, Rautenbach said. He said expected changes of plus or minus 10 percent from present annual rainfall totals may seem minimal, but it’s the shift in water patterns that are of concern. “The rain belt over Uganda will shift, in that areas like in the Northwest and Western regions, which have been receiving minimal rains, will receive more rains compared to the Lake Victoria region,” Rautenbach explained. Lake Victoria, which has been receiving high volumes of rainfall, will experience a 20 percent drop in rainfall from present. This, coupled with evaporation due to an anticipated temperature rise of about 1°C over Lake Victoria, will cause a drop in water levels very soon. East Africa is also projected to experience a change in mean annual precipitation. This will result in increased rainfall over the short September to November rainy season and it will mean that the long rainy season, which takes place between March and May, will reduce. This will negatively impact Uganda’s farmers particularly those in in areas were vital crops such as coffee, tea, cotton and maize are being grown. Youba Sokona, chair of the IPCC Working Group III that looked at possible mitigation measures, advised that the Uganda government invest in research for varieties to withstand the changing climate. “Crops varieties as we know them today could not withstand the change and Uganda like other East African governments has no option but to race against time and fund research into new varieties,” said Sokona. The Ugandan government, however, say they are taking the warning seriously and are developing strategic interventions to mitigate the effects. Dr. Anuciata Hakuza of the Ministry of Agriculture, Animal Industry and Fisheries, said strategic interventions include promoting and encouraging highly adaptive and productive crop varieties and cultivars in drought-prone, flood-prone and rain-fed crop farming systems. She said other adaptation strategies that the government was working on include highly adaptive and productive livestock breeds, conservation agriculture and ecologically compatible cropping systems to increase resilience to the impact of climate change. Hakuza said the government was also promoting sustainable management of rangelands and pastures through integrated rangeland management. Uganda’s climate change policy also provides support for community-based adaptation strategies. Dr. Chebet Maikut, one of Uganda’s negotiators to the Conference of the Parties, told IPS that there are plans to develop innovative insurance schemes, such as low-premium micro-insurance policies, and low-interest credit facilities to insure farmers against crop failure and livestock loss due to droughts, pests, floods and other weather-related events. “Traditional finance institutions have already been reluctant to fund farming so as the risks grow even further due to climate change there will be need to develop insurance polices,” he said. Uganda also plans to promote irrigated agriculture, and improved post-harvest handling, storage and value-addition in order to mitigate rising climate-related losses and to improve food security and household incomes. Maikut argued that all these plans require huge investments. He said in addition to the funds that Uganda was making available out of its national budget, developed countries should also be willing to make contributions. People can diss GMO crops all they want but if We are to continue feeding an expanding population and putting more land under pavement or home sites then GMO crops are one way of feeding people and there is no proof they are harmful to health.This is a myth pushed by people trying to make a name for themselves! And just what GMO or non-GMO crops will be beneficial to grow in this region when the climate has changed so dramatically. I’d suggest you put away your little pro-GMO rant and concentrate on the issue at hand rather than tossing hubris into the research for successful replacement crops. All of you have forgotten the melting of mountain glaciers in the mountain of the moon. The Sudanese, Congonese and Egyptian underground water tables are fed by the African glaciers that are recieding and will be a thing of the past by 2030. With the demise of the african glaciers, the desert will continue southward and consume the Congo. Hint: the water source of Lake Victoria is what ???? Answer: mountain of the moon !! !